I had a little (unexpected) time today and so I decided to develop the theme began yesterday and show the way that lino was heading towards the end of the mid-century decade. Computer problems take your mind away from what you are doing but they also give you a little expected free time which you can use. Linoleum began to be popular at the turn-of-the-century and a good many formal designs were created during the 1920s and 30s and up to the outbreak of the Second World War. After the war, lino continue to be made using these type of designs as I showed yesterday. However the 1950s gave way to a very exciting decade in which design moved forward at a hectic and sometimes alarming rate. Much of the work that was done at that time was never carried forward into the succeeding decades and so much of it is lost. During the 1960s the newspapers and the television was full of the scientific discoveries that were being made, particularly atomic one. The new designers that were then starting work were influenced by what they saw and produced some spectacular and inventive artwork. Some of the scientific work depicted the results of atom smashing, something that is taken for granted today but which at that time seemed almost science-fiction. This lino is inspired by some of the patterns that appeared which show these explosions beautified in the minds of the designers. I have deliberately kept the scale of the pattern quite large which I think is consistent with the way that linoleum was produced at that time. The pattern was made in Adobe Illustrator but the background is a seamless tile produced in Filter Forge. I have to admit to being rather pleasantly surprised at the look of the pattern on the floor, particularly with its mid-century appeal and colouring. 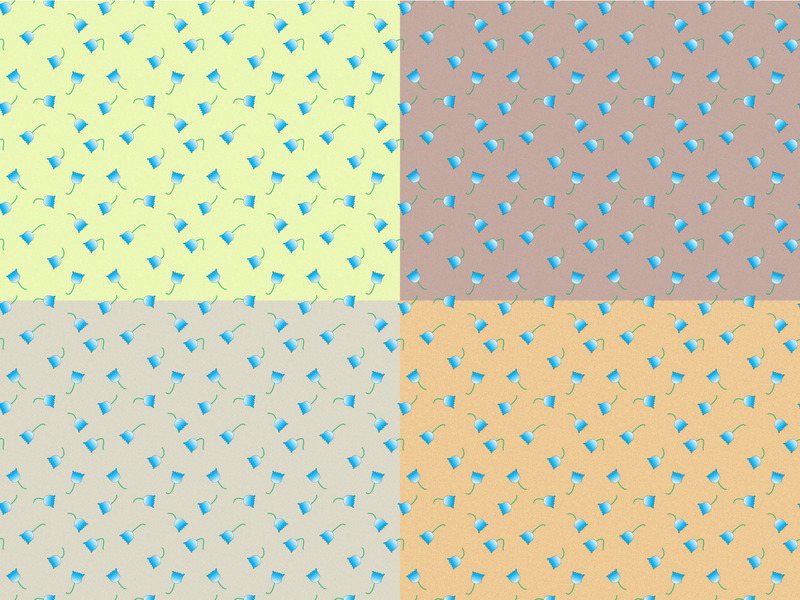 I also created the pattern with a different background and those two patterns appear as swatches on my Flickr page. A large version of this image is on my Flickr page which is here. 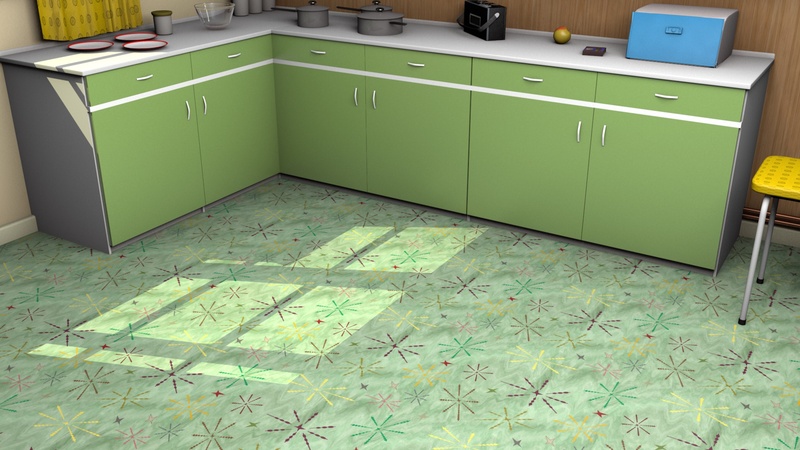 Lino, or linoleum, was a very popular product in the mid-century houses having gained popularity from pre-war years for its longevity and ease of cleaning. In fact, a visitor from the present-day, would be surprised at how much linoleum was in use both in the home and in commercial premises. In the early years of the decade patterns tended to resemble those from pre-war years and these were seen as cheerful patterns that could be used to show the size and space in a room or hallway. Later in the decade lino, along with other fabrics and household furnishings, received considerable treatment at the hands of designers. I have already produced some mid-century lino but this is an area that I hope to visit again shortly. Ease of cleaning for both minor and major domestic issues made lino a popular choice for household hallways, bathrooms and kitchens. The illustration above shows my mid-century kitchen set with a lino floor that uses a very standard and extremely popular pattern. This pattern, and patterns like it, give a room a clean and precise look emphasising the dimensional and creating what appears as a large floor area. For this reason patterns like this were very popular and, if you look carefully, you will find that this, and similar designs, are still on sale today and are still fulfilling the same purpose. This set, and all the objects and materials in it, were created by me in Cinema 4D with the exception of the copper texture and the glass both of which come from Maxon. By 1956 Great Britain was beginning to recover from the devastating effects of the Second World War and, at last, money was beginning to appear in people’s pockets. By 1950 vast numbers of people had returned from the war to settle, marry and start a family and thus required rehousing. 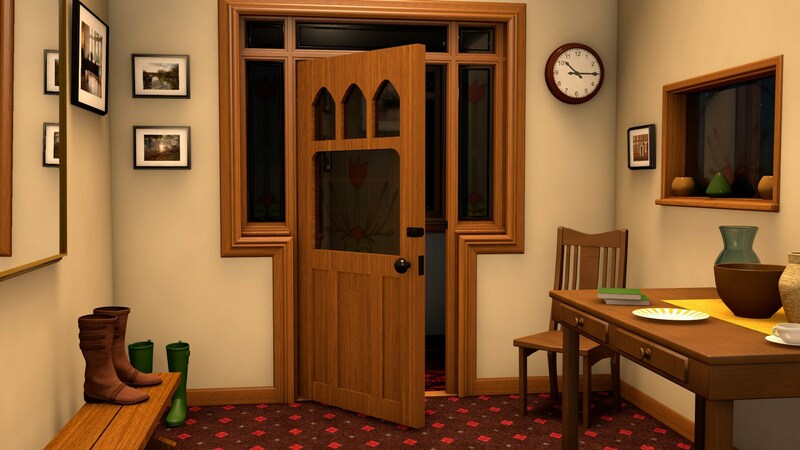 In was in this period that Great Britain embarked on a comprehensive house building and rehousing program which resulted in, amongst other things, a demand for interior furnishings. War-time furniture had been very utilitarian but by the start of the 1950s decade a little more thought was being given to design and style even though raw materials were in short supply. This image above is not designed as a picture of 1956 life but simply as an image to show the type of furniture which would have been available to the householder looking to furnish a new apartment or house. The corner unit is a fairly simple and basic model which has a considerable capacity for storage and would have been a very useful item to have. This is particularly so since it sits in the corner out of the way. The bookcase next to it is a more expensive item with a glass front. Books and other reading material were seen as important, particularly for a family with school-age children, and so a bookcase will always be found in a 1950s home. The table and chairs are typical of those produced during the period and were an important part of the household since, in those days, everyone sat at the table to eat their meals. The wallpaper and carpet are of contemporary design and use mid-century colours, as is the fabric used on the chair seats. These items have now been added to my stock ready for a 1950s look at life which I hope to be able to do in the coming few weeks. It is interesting to reflect that, although this furniture is almost 60 years old, similar items could be purchased today on the high Street. A full size image is on my Flickr page which is here. Furnishing fabrics are an important part of designing and producing patterns and yet they tend to be overlooked as being unglamorous and perhaps not so easy to create. I have to be honest and say that creating patterns with a small repeat and which are, within themselves, compact and quite geometric are a pleasure for me and so furnishing fabric patterns are something that I enjoy making. The pattern shown in these two images is exactly the same pattern, believe it or not, and if you look closely you will see that this is true. The difference, of course, is in the colouring and the contrast between the colours. The red pattern is intended to be more noticeable, to have more contrast and to catch the eye, directing the viewer to the furniture in question. Such a pattern would, for example, be ideal for indicating the position of furnishings on which to sit or simply to highlight a particularly nice sofa or chair. The green pattern, however, is not so readily noticed and, as I hope you can see from the illustration, blends into the forms and colours of the room. Such a fabric creates a relaxed and peaceful atmosphere and so works well in rooms designed for ease and comfortable living. 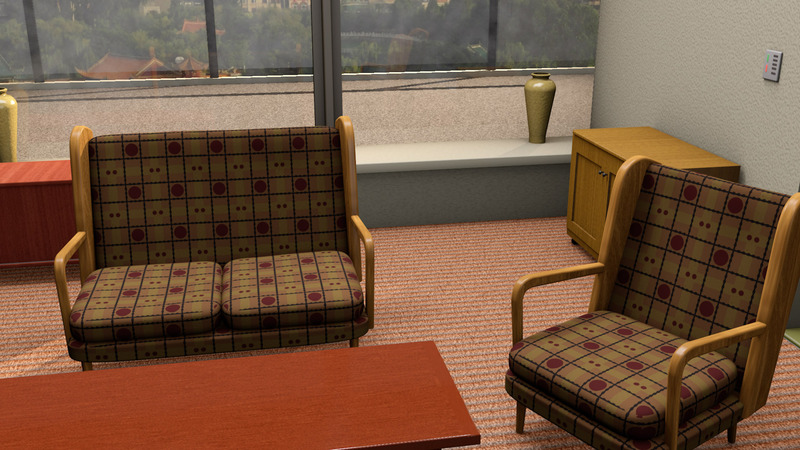 It is also the sort of pattern that works well in a commercial setting where simple colour and design for a seating unit is all that is required. Again, I have to be honest, I enjoyed creating both these two patterns and the images that you see above which I think reflect the intention behind the patterns and hint at their possible use. Although not designed as representative of a particular period, these patterns could well be mid-century or possibly have been created up to the present day. I have added these patterns to my rapidly growing stock of interior design textures and so I expect that I will have occasion to use them in a, possibly mid-century, room shortly. Hallways have always interested me because they can be the neglected areas which, for that very reason, reveal the character and style of the occupants of a house in a true and unadulterated light. Some hallways are compact, neat and well arranged while others are a messy sprawl of outdoor clothes, unwanted furniture and the general bric-a-brac of life that has nowhere else to go. This hallway, by comparison, is a large room in a substantial Edwardian style house which has at the front a small porch. The hallway has some older items of good quality furniture which maybe now have become surplus to requirements. Perhaps the table was once a kitchen table or possibly the dining table and the chair likewise while the bench may have always been in the hallway. The owners of the house have added some personal effects but have left the woodwork as it perhaps would have been when the house was built. Overall this was a very enjoyable and challenging project to make and I am quite pleased with the result. 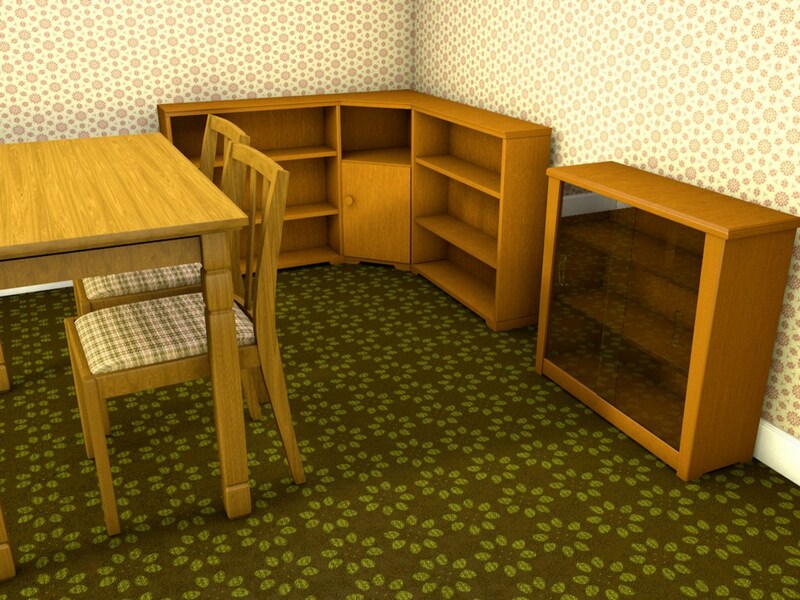 Everything in the scene was made by me with the exception of the two pairs of boots which came from another 3D program. The room was put together in Cinema 4D and that program was used for the render with some slight post-effects in Photoshop. I love the 1950s wallpaper, the designs are so fresh and modern and quite unlike anything that had gone before or, for that matter, anything that came after. This wallpaper design could only be from the 1950s and this sort of pattern appeared a lot in various incarnations to grace the walls of the new houses that were built following the end of the Second World War. For authenticity the colours for this design come from the palette created by the British Standard Institute in the 1950s. And so I can safely say that the colours are authentic although, it has to be said, not all wallpaper manufacturers followed these particular colours. The design is bold and fresh and is shown here at quite a large scale which would have been alarming and quite alien to pre-war tastes. However, designs like this found favour because they were new and represented the feeling of the new start which characterised the, it has to be said, rather austere early years of that decade. The design was created in Adobe Illustrator while the image was rendered using the Showcase set in Cinema 4D with just three items of contemporary furniture that I created some time back. Fabric patterns, especially those with small motifs and a quick repeat, have always fascinated me and feature a lot in my work. To understand what this is all about you will need to look at my Flickr page (the address is below) to see the four images of this fabric pattern with the different backgrounds. This design was created originally as a simple pattern for wallpaper, designed to be unobtrusive and the sort of wallpaper that you might have found in a mid-century bedroom or the lounge of, maybe, older people. Having created the pattern I began to experiment with different mid-century colours to get the right sort of 1960s look. This post is the result of that work and the four patterns that I have chosen and which are shown above, are reproduced in a room as four 3D renders. There has been no, despite the urge to do so, post-processing on any of the images and, other than ambient occlusion, there is nothing added in the rendering process. The lights are an overhead area light and a spotlight some distance away. It is very interesting to look at the quite different effect that these four wallpapers have, bearing in mind that the only difference between them (I promise you) is the background colour. The difference that you see is the result of the way the light is reflected back from the wall and, so far as I know, this effect is mirrored in the real world as well as in Cinema 4D. Incidentally, the backgrounds are not solid colours but mid-century fabric colours created with Filter Forge however the effect with a solid background colour would be very similar. The result of all this is that picture number two has, I think, the most true-to-life mid-century look and feel and for that reason you may see this particular pattern again. 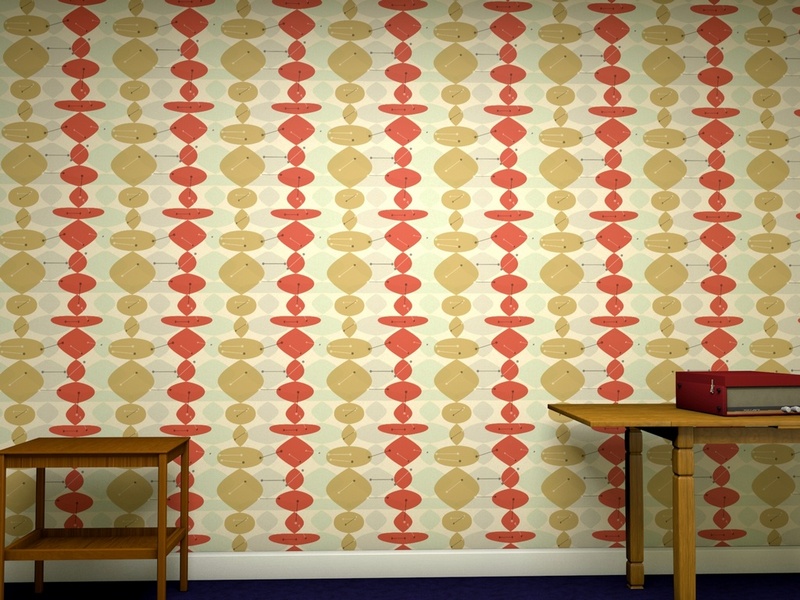 So far as the other designs are concerned, I am quite happy that they look mid-century and they will certainly find a use as wallpaper in other rooms that I create.